With Total Audio Suite, you can easily record sound from any audio sources. With Total Audio Suite, you can easily record sound from any Audio sources. Record Audio from, CDs, microphone, internet streaming, radio and other sound card inputs. Play the output recording inside the program to see if the quality meets the needs. With few clicks, you can adjust the frequency, bitrates and select channels. 4Videosoft DVD to Audio Suite is combined with two audio converter, DVD to Audio Converter and Video to Audio Converter. 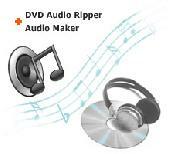 Which helps you to rip DVD to audio WAV, M4A, MP3, AAC, WMA, AC3, OGG, RAM, RA, convert video to audio. Total Audio MP3 Converter keeps ID3 tag when converting. Total Audio MP3 Converter keeps ID3 tag when converting. And, you can add customized ID3 tag to target file when converting. Total Audio MP3 Converter enables you set encode codec, sample rate, bit rate, and channels of target format. The converter supports batch conversion. You can convert or resample bulk of files at a time. The complete Audio Suite. Record/rip files from CD/DVD. Edit your files using the editor, optimize it with easy assistant and finally transfer your files to mobile devices like USB, iPod or burn it to CD/DVD. AudioAnalyser is a realtime frequency analyser for audio signals. You can combine the "AudioAnalyser" with other application like "Multisine", if your soundcard supports the full duplex mode (only very old soundcards don't). With this combination you have a full equipped Audio Suite for your measurements. SolveigMM MPEG2 Requantizer Component is an engine designed for a fast and high-quality recompression of MPEG-2 high bitrates video. SolveigMM MPEG2 Requantizer Component is an engine designed for a fast and high-quality recompression of MPEG-2 high bitrates video. The component has been implemented as DirectShow filter. One of its main purposes is a fast DVD back up. 4Easysoft DVD Converter Suite Combines of DVD Converter Platinum and Total Video Converter. It can help you convert DVD and video file to other video formats you want. Also, it can convert DVD/video you select to MP4, WMV, MOV, DivX, MTS, etc.